A very popular French music magazine, Danceur, dedicated the entire 62 page July issue to the career of Nyls! 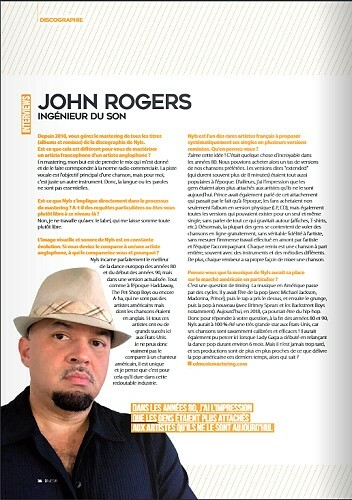 Me being his primary mastering engineer, they ask me to be part of the NYLS collectors issue. Below is the interview, in English. 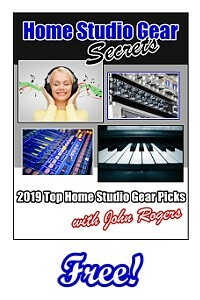 John Rogers - Mixing & Mastering Engineer Since 1999, I've mastered over 40,000 songs for over 7,500 clients at my studio JRmastering.com. 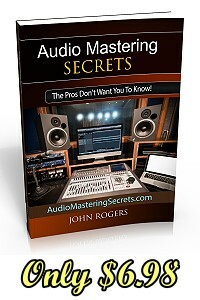 I'm also the author of the best selling audio mastering book on Amazon.com, Audio Mastering Secrets. 1. Since 2010, you manage the mastering of the Nyls discography (albums + remixes). Is it different for you to master a French vocalist artist from an English vocalist artist? In mastering, my goal is to take the mix I am given and sonically match it to the commercial radio standard. The vocal track is the main focus of a song, but to me it's just another instrument. So, the language or lyrics are irrelevant. 2. Is Nyls directly involved in the Mastering process? No, I only work with the label. 3.Does he have any particular requests concerning mastering, or are you rather free at this level? I've mastered many songs played on the radio in Romania from Andra, Smiley, Mihai Ristea, and Miss Mary, and in dance clubs all over the world. So, the label was confident I would do a great job for them, and pretty much just let me do my thing. 4. The visual and sound image of Nyls is constantly evolving. If you had to compare him to an English/American artist, who would you compare it to and why? Nyls is pretty much the europop dance music from the 80's and early 90's. Like Haddaway, The Pet Shop Boys, and A-ha. Those aren't American artists but their songs were in English. And all of those artists had big hits here in the U.S. Off hand, I really can't compare him to an American singer. 5. Nyls is one of the rare French artists to systematically propose his singles in several remixed versions. What do you think of it? I love the idea! This was big in the 80s. We used to buy all the different versions of our favorite songs. Long extended versions (like 8 minute songs) were also popular back then. I believe back then people were more attached to the artists than they are now. Prince actually mentioned this. He said, back then fans bought the physical plastic album/CD, all the different singles versions, a poster, a tshirt, etc. He said they were true fans who collected everything the artist created. Now, people just steal songs online for free with no real loyalty to the artist. 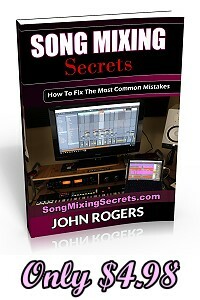 6.Is it different for you to master a remix from a album version, from a technical point of view? Each remix is an entirely different song, many times with different instrumentation and melodies. Also, each remixer will mix his song differently. Everything is handled on a song by song basis. 7. Do you think that Nyls music would have a place in the American market in particular? It's a timing thing. Music in America goes through cycles. There was the pop era (Michael Jackson, Madonna, Prince), then rap got big, then grunge, then back to pop (with Britney and the Backstreet Boys). Now in 2018, it might be hip hop. In the late 80s and 90s, 100% yes, Nyls would have done very well! There was also a 6 month window Nyls would have done well when Lady Gaga was big here and pop dance was hot.